I love cyanotype! 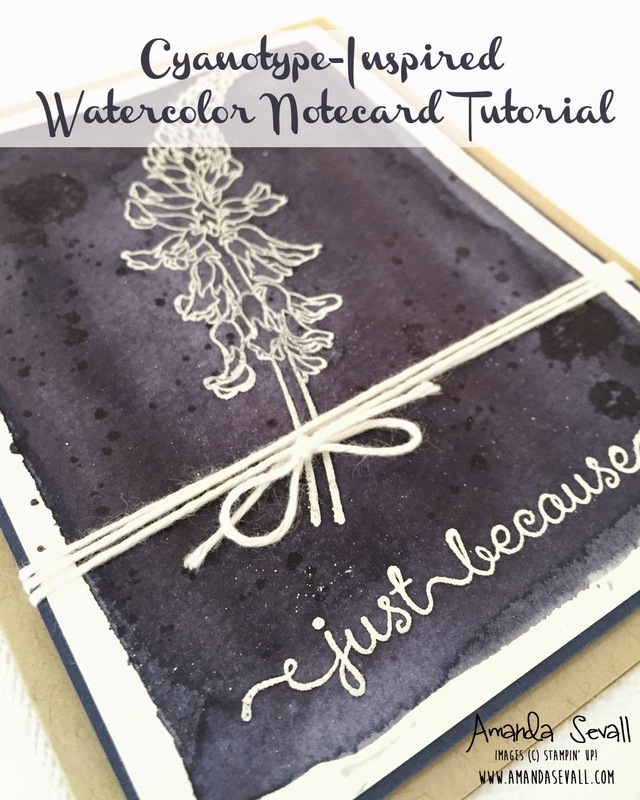 I thought it would be fun to recreate it with watercolor and one of my favorite stamp sets... And I wanted to share a little tutorial with you so you can create your own cyanotype-inspired watercolor notecards! Cut: From Crumb Cake cardstock, cut one 5.5" x 8.5" card base (score at 4.25"). From watercolor paper cut one 5" x 3.75" piece. From Night of Navy cardstock, cut one 5.125" x 3.875" piece (this piece is 1/16" larger on both edges than the watercolor paper piece -- just go one line up on your trimmer!). Watercolor: Tape down the watercolor paper to a scrap piece of cardboard using either washi tape or painters tape. Using Night of Navy reinker, drop a 2 drops of Night of Navy ink into an empty tray (you can use the lid of your Night of Navy ink pad too!). Take your Aqua Painter and squeeze 2-3 drops of water in your 2 drops of Night of Navy ink, then stir with the tip of the Aqua Painter to mix. Watercolor the paper in layers -- you'll want to make a square, then fill it in. Dry in-between to add dimension and depth -- two to three layers of watercoloring will get you a really deep, rich color. In the video above, you'll see that I only did one layer, but you can do two or three! You'll also want to go a little lighter in the center on the ink. Tip for drying -- to speed up the process, use your Heat Tool! Stamp: In Night of Navy ink, stamp the ink drops from the Gorgeous grunge set in the upper left area you watercolored, then re-ink the stamp and stamp it again just above the end of the word "because". Also in Night of Navy ink, stamp the little ink spatter from the same set all over the watercolored area. Once done stamping, you can wipe any ink off the embossed area with a tissue or paper towel, if needed. Assemble: Glue the watercolor paper to the Night of Navy cardstock mat using SNAIL. Then wrap the watercolored piece with Whisper White Bakers Twine, tie a bow over the stem of the flower, and trim the ends of the twine after tying the bow. Using Stampin Dimensionals, glue the watercolored image with twine to the Crumb Cake card base. I tried the tutorial and loved it!